Purchase this product now and earn 2,400 Reward Points! 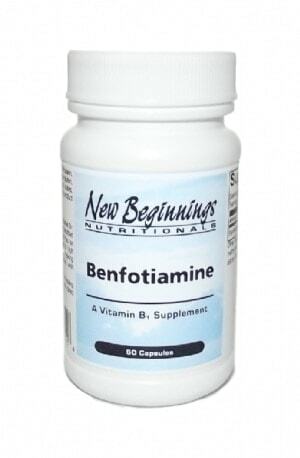 Benfotiamine is a fat-soluble form of thiamine (vitamin B1) with high bioavailability. It is especially useful for people needing high levels of thiamine or with impaired absorption of this essential B-vitamin. Oral benfotiamine passively diffuses through the intestinal mucosa and is rapidly converted to active thiamine. Its absorption is much more efficient than water-soluble thiamine which requires active transport. Benfotiamine intake attains higher plasma and tissue thiamine levels and maintains these levels longer than common forms of thiamine. 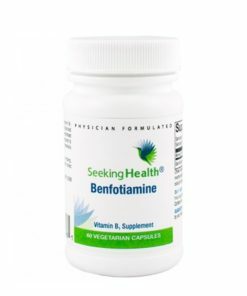 Bioavailability of benfotiamine is up to 3.6 times greater than water-soluble thiamine salts and is associated with a 120-fold greater increase in the levels of metabolically active thiamine diphosphate. Benfotiamine inhibits several pathways involved in glucose-induced vascular damage and neuropathies. 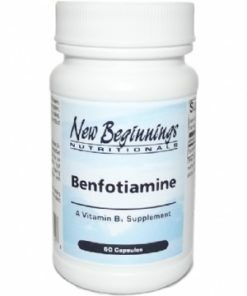 Clinical studies show that benfotiamine may be particularly indicated for people with diabetes mellitus, chronic renal insufficiency, and chronic alcoholism to support neurological function and protect against formation of tissue-damaging advanced glycation end products (AGEs). Benfotiamine may also be a preferred choice after bariatric surgery as thiamine deficiency is frequently found in these people due to malabsorption. Suggested Dosage: Take 1 capsule daily with food. Other Ingredients: Vegetable capsule (hydroxypropyl methylcellulose, water), cellulose, L-leucine, and silicon dioxide.